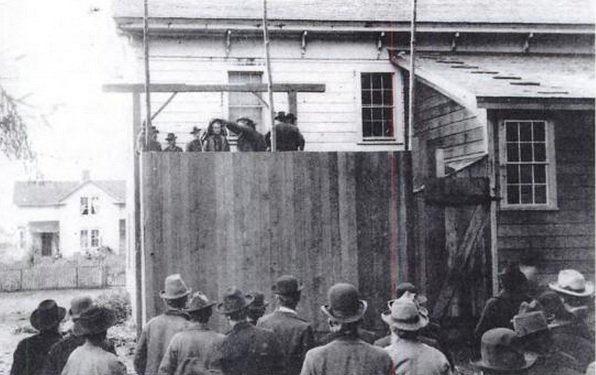 The story behind Coleman Gillespie’s execution on this day in 1900 actually begins on February 21, 1856: on that winter’s day, a small group of hostile Rogue River Indians murdered more than half of Christina Edson’s family at their home in what would become the state of Oregon. The victims included John Geisel, Christina’s husband of 13 years, and their sons Andrew, 5, Henry, 7, and John, 9. Christina, her three-week old infant Annie and her thirteen-year-old daughter Mary were spared and force-marched into captivity at an Indian camp twelve miles away. Along the way they had to pass the burning houses and dead bodies of their neighbors. 24 people were killed and 60 homes burned in all. The pioneers wanted vengeance and they got it: the rebellious Indians were defeated in May 1856 and mobs lynched more than a dozen of them, including the man who betrayed the Geisel family. In July of that year, more than 700 Indians were forced to relocate to two different reservations. All in all, it was a terrible tragedy. And four decades later, indirectly, it claimed its last victim. Christina, somehow, put her life back together after surviving two weeks in captivity with her daughters. 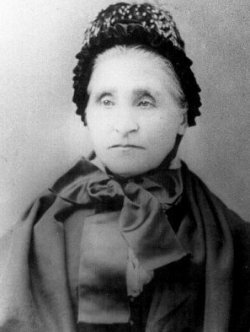 She never had any more children, but she remarried three times (divorcing twice, and being left a widow with her final husband’s death in 1883). In 1887, Christina filed a claim with the federal government seeking compensation for the loss of her first husband and sons and their farm, which the Indians had burned down. It took twelve years to get through all the red tape. In the end her application was successful and she was granted a monthly pension. Christina turned 77 years old in 1899. Although her grown-up daughters wanted her to move in with them, she cherished her independence and lived alone in a cabin in Gold Beach, Oregon. Her very first pension check, for $75, arrived Monday, September 18, 1899. On September 19, her cabin burned to the ground. The postman found her charred corpse lying sprawled on her bed in the ruins. She’d been tortured and strangled. The fire was arson, and authorities presumed Christina had been killed for her money; her pension check was missing. Christina Edson had seen her husband and sons tortured and burned by the Indians. The savages could be excused because they were fighting for their rights to the land they once owned. [Christina’s murder] was even more horrifying because it was done in cold blood for a few dollars. The police got a lead when the check was cashed in Roseburg by one C.O. White, who was brought in for questioning. He said he’d bought the check at a discount from Coleman Gillespie, a known criminal with two prior convictions for theft. Arrested a few days later, Gillespie quickly broke down and confessed in writing to Christina Edson’s murder. He named his co-conspirator as Charles Strahan, a commercial salmon fisherman who had mysteriously disappeared. There were rumors that he’d tried to flee the area but had drowned in the Rogue River, and other reports that he’d drowned in an ordinary fishing accident: whatever the case, he was never seen again, neither alive nor dead. Authorities thought the fisherman a red herring — that Gillespie had acted alone and, having heard of Strahan’s disappearance, tried to share the blame with the convenient phantom. Gillespie’s statements about Christina Edson’s murder over time evolved to shift ever more responsibility onto the missing “accomplice”, until Gillespie was all but denying his own presence at the murder scene. He didn’t really seem to realize that, at the end of the day, he was legally just as guilty whether or not he himself had done the killing. He found out on August 23, 1900, when he was condemned to die for robbery and murder. 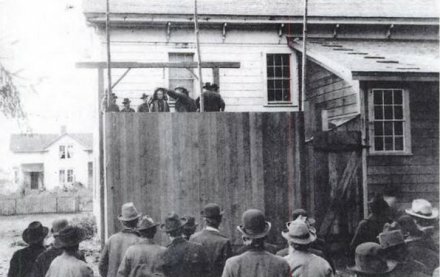 When Coleman Gillespie was hanged six weeks later — the first and last legal execution in Curry County — his neck didn’t break. He expiated every penny of the discounted $75 pension check slowly strangling at the end of the rope.